All Deviants, Staff, Seniors, and Community Volunteers are a part of this awesome, socially-artistic networking site where we can interact and help each other by critiquing, featuring, commenting, and collecting artwork or finding new artists by searching the cool, yet small, corners of the site. But with all this awesomeness, some or many of us are sometimes stuck in a situation where we become bored and shut our computers down or senselessly move our mouse pointer in a circular direction. To keep such events from occurring, and with such an amazing site in front of you, I'll be giving you some tips and ways in which you can keep your BOREDOM AWAY when you're online on DeviantArt! This great practice benefits both others AND yourself... GO AND BROWSE ART! Art pieces here on DA are different from the art pieces you may find near your home. The pieces come a variety of styles, genres and fandom that are there for your viewing pleasure! While browsing art, you will come across a binge of artworks from very cool, popular, and awesome all the way to those pieces that are amazing but under-appreciated. Browsing is the key to finding some new favorites that were once hidden artists on the site! Therefore, keep browsing and discover a wide range of lovely artworks that make your day! This is a really great thing that you can do for others... GIVE HELPFUL FEEDBACK! An amateur artist always aspires to receive helpful/constructive feedback on their artwork and by commenting/critiquing their deviations, you can fulfill this dream of a deviant. This will not only enhance your conversational/social skills, but at the same moment will increase your potential to give constructive feedback to other artists too! Collecting art is another way to put a smile on the face of the artists and alleviate your boredom. Beginner Artists who are new to this site usually receive less feedback because they aren't aware of the possibilities of this community. For example ME, yes... when I joined this site with the username of Tudalia222, I was very young and was thrilled to receive even one favorite from anyone... And if I somehow got more than five faves, I would be the happiest person on this earth. But I lost the password and made this account and then I learned more about this site. So even ONE FAV FROM YOU CAN MAKE SOMEONE VERY HAPPY! Also if you find your fandom artworks, then there's always a possibility of you faving tons of work from that particular artist! DeviantArt is a site that allows you to create chat rooms or Forum posts and blissfully socialize with the people from different parts of the world. This can be done through The forum and chat pages! These are some really awesome places to hangout when you are BORED! The forum allows you to create forum threads in which you can post anything and everything that follows the rules of that section of the forums. For example, the Deviants forums allows you to post almost any kind of threads according your thoughts. The Chats are a place where you can find a room for yourself and endlessly chat with other deviants. You can create your own chat room too and invite your friends to chat with you! The BEST THING that you can do to help/make happy other deviants, is BY FEATURING THEM VIA A JOURNAL! This is a really good way to show your affection toward other artists on DA. Especially the under-appreciated artists, who will feel really great! Also, this not only makes their day but will make you feel good too. Plus, featuring other art may inspire you and motivate you! I remember starting my first volume of ProjectStarshine. The replies and blessings I got from other deviants were really encouraging! Trust me, it feels really nice to help someone get the attention they deserve! Be it fame, feedback or justice. Therefore, give the community back the love which you've got from the community... This will help in continuing the cycle of friendship, love, sharing and MOTIVATION on this site! Be polite to others as well, like TheGalleryOfEve always says! So, here we all are! We have reached the end of this journal and I just wanted to tell you about my experiences with this awesome site when I was very young to being 14 now! These few years of mine of this site have been very encouraging and helpful as well for me! From being a socially introverted person to an amateur devious person... From a little artist to a helpful teen, this site has brought many happy and sad news throughout my time here. I've received a lot of love from the community and a few shocks too! There was a time when I hated being here but my friends, the forums, and the community's love sparked a rebirth in me. I transformed from a lost soul to a Friendly Goth! These were few of the words that I wanted to share...You are AWESOME. Keep being AWESOME! I thank all of you, my friends, the editors, the advisers, and all the other staff people for helping me out in bringing up this article! If you hadn't been there, this article wouldn't have been a successful one! KEEP BEING AWESOME! I hope ya all liked my article ! Thanks for sharing these uplifting words. I this article so much! Another thing I've found really helpful is to actively avoid areas where people grump and whine about how terrible DA is (word for word the same bitching that people have been doing for at least the last 10 years) and focus on lovely things, like finding new art to look at, writing critiques to help people improve their photography and reading journals to keep up with what my friends are doing. Motivation on DA isn't my problem. Hey ja Tudalia! Good thoughts, good motivation! You are describing one side of dA! The light and blissful one! It's good to listen to your words! But isn't there also another side of dA you have to have in mind? The green gray depressive site look. It's still like middle age or even stone age and not like 2015 where technically everything is possible. Nothing changed in this way for 15 years. DeviantArt looses more and more valuable artists and members because technical it's still an old fashion system. The ugly green gray outfit is discussed for many years, the stupid fav system also which degenerates real art, it has to be more differentiated! The pay and points system, which shows we are customers and not artists - money seemed to be very important for dA. The public relation of dA outside of dA is nearly SERO! All are friendly to each other - but is this enough of an art forum huge like dA? All this is far away from todays modern thinking and todays possibilities. This makes members boring. Yes, your words are like sunshine! On the other side: many volunteers work here hard to have some more light on dA! But they work for free - get not paid in points or dollars. They put every minute of there time here to run the main interesting things for artists like DD's and blogs and education. This not paying system is also not up to date. I think both sides (making money with Core Membership, SuperGroups, PrintShop and Advertising and not paying Volunteers and some StaffMembers) have to be improved also. It's only my very personal view. But it's important too. When you give your best you have to a deviantArt Galeries you can expect a lot also from dA - more than you get now. If nearly nothing comes back it's frustrating. dA is a place not only for beginners. Hey Michael I think you might want to take a look at this ---> Profile Discussion The DeviantArt Timeline entries from the past few months have discussed how we’re focusing on user experience for DeviantArt and ways to make the site more intuitive. In this journal, we'd like to kick off a discussion on another big design-related milestone: to improve the profile experience on the site, mobile web, and mobile apps. At the fore More specifically at point #4 They're actually working on that!!! (along with a few other modernizations ) ... So we'll see what happens!!! I'm not curious at all! I had to see the now famous notification! Fine to know that they are working on that. Thank you so much for this hint! Time is ripe for a big change! Heidi has put together there nice samples of a DeviantArt 2.0! I just have to be more patient! A lot of artistic/creative type companies look at the work you do on DeviantArt these days. I think, even with the grey/green colouring, which may or may not be depressing to some, it is iconic and memorable. I've been to other websites that use colours for artists like flat black or a light brown. The black i couldn't stand. the brown was tolerable, but I found i kept getting lost on the site.. perhaps it wasn't related to the colour, but i do remember the site and its colour, so who knows... but DeviantArt has a well set out place for everything, from galleries, to forums, to your own pages etc. It has clear markings for everything and is extremely simple to navigate. it offers so much in terms of customisation, and this is what makes it unique. And while the iconic colour has stuck around (and i personally like it) I truly think that it's not going to just go away. DeviantArt has ever been a stand out place. It's - slowly, over time - changed its face to suit the times, and to suit the needs of the community. While this also means that not every individual needs are completely met, the general overall needs are usually always listened to, considered, and a lot of the time, implemented in a way that both suits the site and the community. It may not be exactly what people suggested or demanded, but the staff work with what they are given within the restrictions they have, with the purpose given. 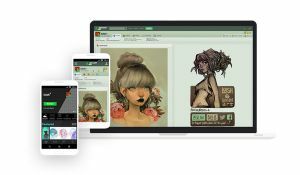 I think the flexibility of the site makes it easier for artists to show their work. While I agree sometimes this does make us consumers, this website is built and upheld by the people that contribute to it, financially. The money won't create itself, and its because of the contributions that you get more customisations, more changes, easier access, etc. And this is fair, in my opinion. You can't expect to be a member of (for example) a not for profit organisation, if you haven't paid to be part of it. (no i'm not suggesting DA is not for profit!.. this is an example)... Because you can't get the help and necessities unless people contribute! Unfortunately, that is just how things work these days. Nothing is free. even being an artist comes at some kind of financial cost, if not to you, than at least to some other person. So... At least there is a place for you to express yourself, and enjoy the expressions of others. The content is more important than the color. Thats right. But the content may look better if you can choose the color around. I like your answer. The discussion is open. May be more answers will come! Well one of the new things they're looking to change for members is high customization but yes I'd like to pick my own colours. I getcha. I don't know, but maybe because you keep talking about "prizes", instead of "prices", the other part is confused? Artist Toolbox - Game Art toolsSo as per the theme of Artist's Toolbox week, we continue on with the various tools Game Developers, or more specifically, Game Development Artists would use Now these are only some tools that I will go into detail with (generally the main ones) but I will list various others at the end of the article that I know of but are less common. One of the main Game Development tools out there for concept art, texture art, storyboard art, etc. Photoshop is a must have must know tool in the GDA world and is often one of the main programs installed at various studios. Photoshop has evolved from what it was originally (quite literally a photo editing tool with basic art skills) to a program a large margin of any artists use today. There's tons of tutorials out there for it and many resources out there to help with the learning process. Art TradesI have friends here that I've known for years. We all do. I think we all wish that we could be closer to our da friends, too. We're from around the world, but we know each other better than people we know in real life. We want to bridge the gap, but a lot of us feel more comfortable having internet friends rather than scary real life people! The best way I've found to do that is through art trades! I traded for by JohnPipere. Traditional art makes for the best trades because they leave you with something tangible. You can touch the art, and feel the work and emotion that the other person poured into their work. It's easy to imagine them putting brush to canvas or pen to paper. This tutorial was created for projecteducate. It covers my general digital art process from start to finish. This artwork was created in SAI, but should be applicable to any digital art software. Some basic steps are omitted assuming the reader is familiar with the basic functions of digital art software. Otherwise, my inbox is always open if you have any specific questions! Some basic tips and tricks for Paint Tool SAI. This may be helpful if you are new to the software. I made a seven-minute video narrating my actions for certain parts of the process. The lines in PSD format, all filled in and ready to color. Many of us crafters use gemstones. Before we can use the little pretty thing, we have to get it first. And here's where my humble article may get useful. I am a historical goldsmithing specialist with a personal focus on gemstones used throughout centuries in artisan crafts. I've seen quite a few of them and believe me - 200 years ago people were as eager to push fakes as natural gemstones as they are now Hell, even ancient Greeks and Romans could say something about it! We will leave the brave people of bronze age for now though and will concentrate on what are most common manmade fakes you can stumble upon while buying gems now. Let's get it started with a stone that is officially most frequently faked stone ever. No, it's not even precious. It's TURQUOISE. Photography Exposed: InfraredPhotography exposed is a brand new series of articles brought to you by your General Photography Community Volunteers! Kaz-D, Mrs-Durden and arbitrarynamechange are going to be exposing the popular and the not so popular galleries within main Photography gallery here on DeviantArt. We're kicking off with Infrared because we can and because it's a brand shiny new sub-gallery of DeviantArt that many of you know nothing about. For more information on how and when this gallery came about check out Infrared Photography - The Gallery is here! Are you an “aspiring” filmmaker? Well, stop that. There is no need to aspire to be any form of artist in this day and age. Just grab a camera and shoot something. Afraid you don’t have the right gear? Do not worry about it. The film Tangerine, which is an award-winning feature directed by Sean Baker, was shot entirely on an iPhone. With the cameras on all our devices in our pockets these days, you can make a film with anything. If you can’t work with what you have available to you, what makes you think you’ll be able to work with a RED or an Arri? At first such a question sounds absurd. If a piece of art was made with digital mediums then it should definitely go to Digital Art, right? Well, not always! First off, there are a ton of sub-categories within Digital Art to begin with, but that's not all, Digital Art also overlaps with other categories, sometimes the theme, subject or intention of the artwork can determine it could go into another category. so how to know which category is more appropriate for your piece? Now it doesn't sound so simple, doesn't? Through this article I'll try to explain some of the aspects to consider and hopefully it will help you know which category is more suitable for that masterpiece you're about to submit to DeviantArt. This one's a bit about communication etiquette First and foremost I believe that we should treat each other with respect and courtesy, be it outside in the world or inside behind our computer screens. Let's talk about the difference between disapproving of an artwork and disapproving of a Daily Deviation feature. To me those are two very distinctive scenarious, that I will try to explore in this article. I will use the word "disapprove" as an umbrella word for all the instances of not liking, not understanding, not agreeing with, not seeing the point of it, questioning the difficulty or technical skills, noticing mistakes or flaws, not liking/understanding the genre, medium or style, etc. pp. In the first 'Simple Guide to Infrared Photography', MichiLauke walked us through his journey with emphasis on filters, specifically the 950nm and 720nm. In this article, I aim emphasise the different kinds of camera conversions that one can obtain, as well as 590nm and 650nm as possibilities for infrared. As a new person approaching infrared, consider whether you would prefer to shoot colour infrared or monochrome infrared. This is worth consideration because the further you go along the electromagnetic spectrum (720nm, 850nm, 950nm), the less colour will be captured. I have been on DeviantArt for a couple of years now, and when I first started here I felt very intimidated by all the amazing artists on this site. At some point, I wanted to do things just like them and copy their styles photography-wise (we are not talking about plagiarism here), so that I'd eventually improve and be noticed on this site. I soon realized that I was doing it wrong. This was when I started to work on having my own art style: something that would define me and not some other artist's work. When the everyday person hears about me shooting film, often their immediate response is, "you do know that we have digital now, right?" The person who asks that question likely sees film as antiquated technology and digital as shiny modernity, but I see it slightly differently. Digital is wonderful because of its convenience and easy correction methods, but to me, film is still a very valid classic art form. I definitely appreciate the ease of use that digital gives me, in fact, I shoot thousands of digital photographs a year. However, film is a different experience, one that, in my opinion, can't just be replaced with digital. I won't be listing off technical reasons for shooting film, instead I'll explain my experiences with film and why I personally still shoot it in 2015. A successful piece of art gives you reasons to come back to it. It provides an opportunity to reflect and, possibly, to explore a conceptual perspective you might not otherwise have access to. Simply experiencing the way someone else visually encounters a part of the world can be a hugely valuable experience. A lot of infrared photographs are pretty, dreamy fantastical landscapes, and very similiar in terms of aesthetic and emotional impact. Pleasant decoration has its place, to be sure; people need to "take a load off" mentally at times. Still, as an artist I want to inspire people to not take their world for granted and, perhaps, to become a little bit more "awake". I want to produce photographs that are more than just pleasant to look at. To make ‘fine’ Digital Infrared images with perfect focus, excellent depth of field, high resolution and edge to edge clarity requires at least a moderately good DSLR and a good lens, an excellent tripod, and an expensive (and sometimes hard to get) filter. Or you can have a point-and shoot or a DSLR permanently converted for infrared . .. at the cost of the camera, and then pay somewhere between $250 to $400 for the conversion. . .